The Cricket Australia (CA) XI has been named to take part in the CA Under 18 National Championships in Ballarat and Bendigo from 14-24 January. 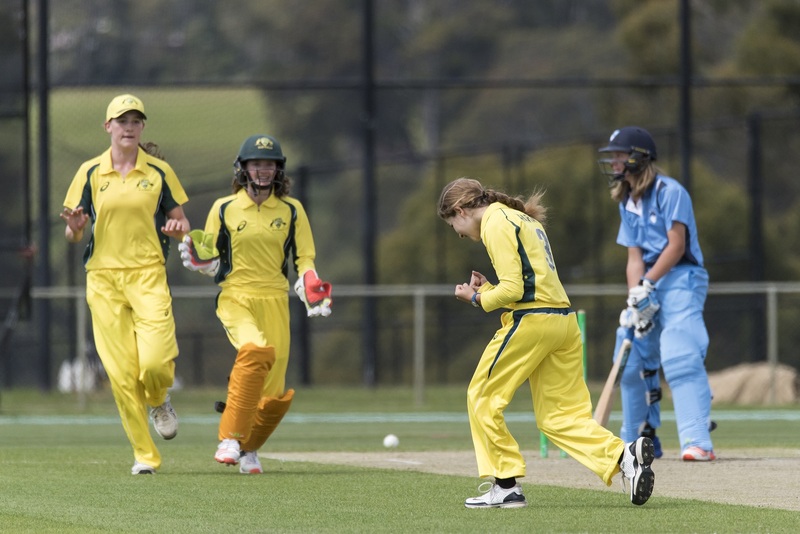 The side, selected by the CA Youth Selection Panel and to be coached by High Performance Coach Leah Poulton and former Australia captain Jodie Fields, features some of Australia’s most talented under-15 cricketers. “The inclusion of the CA XI enables the next generation of under-18 players to test themselves against slightly older and more developed cricketers, including players who hold state and Big Bash contacts. The Championships return to the Ballarat and Bendigo regions for the first time since 2012, and this season will feature two Victorian sides and a team from the Northern Territory. The tournament will again feature separate 50-over and Twenty20 competitions, with T20 night matches to be played for the first time.The 50-over final will again be live streamed on cricket.com.au and the CA Live App. Selectors will be keeping a close eye on the tournament, with an Australia Under 19 team to be named at the conclusion of the carnival to travel to New Zealand in March for three 50-over matches and one T20. “These Championships continue to play a key role in the identification and development players who have the potential to play senior domestic cricket and potentially for Australia, with players such as Tayla Vlaeminck and Georgia Wareham who recently made their Australian debuts taking part in the under-18 tournament just two seasons ago. “The under-18 level is the breeding ground for the next generation of national players, and as a result of the increased opportunities afforded to players to continue to develop through various programs in the redeveloped female player pathway, such as the National Performance Squad and overseas underage tours, Australia is fortunate to have a great depth in young female talent across the country. ACT/New South Wales Country: Alisha Bates, Jessica Davidson, Hannah Faux, Lara Graham, Anita Handono, Emma Hughes, Anika Learoyd, Allison McGrath, Gabrielle Sutcliffe, Abbey Taylor, Alexandra Tims, Sarah Young, Olivia Osborne. Queensland: Kirsten Davey, Renee Irvine, Emma Jackson, Ellie Johnston, Charli Knott, Neve Lynch, Caitlin Mair, Kate McDonald, Lilly Mills, Stacy Rockliff, Courtney Sippel, Emily Vallance, Annie Wikman. Victoria Metro: Ava Bennett, Olivia Downes, Hailey Ferris, Tess Flintoff, Katia Jomini, Jessica Matin, Caitlin Morando, Erika Quinn, Lara Shannon, Eve Sheehan, Holly Spencer, Annabel Sutherland, Olivia Thomas, Alex Clancy. Western Australia: Zoe Britcliffe, Charlotte Cooke, Emma Davidson, Georgie Ireland, Ashlee King, Emma Meuleman, Millie Monaghan, Jacqui Naidoo, Gorgia Platten, Olivia Purnell, Samantha Quadrio, Poppy Stockwell, Soniya Yadav. Cricket Australia XI: Jade Allen, Kayla Burton,Grace Dignam, Georgia Gall, Molly Godsell, Isabella Greig, Ella Hayward, Molly Healy, Emily Hinze, Ruth Johnston, Phoebe Litchfield, Arnika McGregor, Kate Peterson, Georgia Voll. New South Wales Metro: Isabelle Afaras, Stella Campbell, Dharmini Chauhan, Maddy Darke, Hannah Darlington, Stephanie Ellsmore, Angelina Genford, Isabella Malgioglio, Kristen McCormack, Elise Noble, Olivia Porter, Hayley Silver-Holmes, Sarah Turner, Nell Bryson-Smith, Shivani Mehta. Victoria Country: Jaide Anthony, Tiana Atkinson, Letesha Bawden, Lucy Cripps, Merinda Hale, Mardie Hamilton, Alyssa Humphries, Madeline Jones, Meika King, Rhys McKenna, Jasmine Nevins, Lily Tassell, Sophie van De Heuvel. Northern Territory: Alexandra Blyton, Jessica Bradley, Rianna Carlson, Amber Cloughessy, Imogene Fisk-Walsh, Chloe Giacomo, Rachel Hartung, Kira Holmes, Matisse Hunter, Monet Hunter, Olivia Pilkington, Clodagh Ryall, Jemma Savill, Ruby Strange. Tasmania: Chloe Abel, Sarah Breckweg, Bonnie Davies, Amy Duggan, Emma Manix-Geeves, Ella Marsh, Cassie McLoughlin, Grace Molnar, Stacey Norton-Smith, Sophie Parkin, Meg Radford, Clare Scott, Amy Smith. South Australia: Stephanie Beazleigh, Darcie Brown, Rachel Church, Emma de Broughe, Caitlin Edmunds, Sarah Ferris, Taylah Gregory, Tarlee Meaney, Laura Niejalke, Amelia Rault, Sophie Roberts, Katie Rowe, Bella Smith, Ella Wilson. For full fixtures and results, please visit www.nationalchamps.com.au.